According to Jain Scriptures, Bahubali (Gommateshvara) was the second of the one hundred sons of the first Tirthankara, Lord Rishabha and king of Podanpur. Adipurana, a 10th century Kannada text by Jain poet Adikavi Pampa (fl. 941 CE), written in Champu style, a mix of prose and verse and spread over in sixteen cantos, deals with the ten lives of the first tirthankara, Rishabhanatha, also known as Adinath, and his two sons, Bharata and Bahubali. Bahubali's elder brother, Bharat, was envious of his wealth, grandeur, strength and success. His desire was for all of Bahubali's kingdom and wealth, and thus, Bharat decided to attack the lands Bahubali ruled. Fearing that the war would destroy both the kingdoms, as well as thousands of innocent soldiers, the ministers of both sides began negotiations. After much thinking, it was decided that a personal contest between the two brothers would be a better option than war. The brothers were required to enter three traditional forms of martial contest: drishti yuddha, jala yuddha, and malla yuddha. The last battle was to be fought by hitting heads with fists. Bharat had the first shot, because he was older than Bahubali, which knocked Bahubali nearly to the ground. Then, it was Bahubali's turn. Bahubali's name means 'Bahu' - Arm, and 'Bali' - Strength, he was known for the immense strength of his arm. Everybody knew and worried, that if Bahubali's blows struck Bharat, Bharat would probably die. This contest could have been easily won by Bahubali striking Bharat. But as Bahubali raised his arm to land a blow, he paused, realizing that fighting his elder brother for land, wealth, and power was neither sane nor righteous. Indeed, it would have been a grievous moral failure for a son of Lord Rishabdev, who was the first Tirthankar of Jainism, a highly spiritual person. As a rule for a Kshatriya (warrior), once he has taken action, it is not possible for him to withdraw or retreat. So, instead of landing a blow on his older brother with his raised arm, he simply changed direction, pulling out his own hair with the same hand, thus avoiding striking Bharat. With this, he put aside all of his possessions, and became a solitary renunciant. Learning from this example, Bharat came to understand the folly of his greed for land, money, and power forgiving his younger brother. Bharat continued to ruled for some time, until eventually joining Lord Rishabdev as a solitary renunciant. But the fight with his brother troubled Bahubali, so after much contemplation, he decided to give up his kingdom and take up the ascetic life. He took to meditation with a thirst for truth, but - it was for ego that he took to meditation on his own. Among monks who accept monastic vows, one must bow to all others who have accepted previously regardless of age. Bahubali knew that if he went to Lord Rishabdev(Aadinath) for permission to take monastic vows, he would have to bow down to all his 98 younger brothers, who had renounced before him. Bahubali began meditating with great resolve to attain supreme knowledge, but did not succeed because his ego, which stopped him from visiting his father's court, did not allow him to attain this Keval Jnana. However, Bahubali was adamant. He continued his practice unmindful of the vines, ants, and dust which enveloped his body. Concerned, his sisters Brhami and Sundari asked Tirthankar Adinath about their worldly brother Bahubali. Tirthankar Adinath said that, although just moments away from enlightenment, Bahubali could not achieve it because he didn't realise that he was standing on 'the elephant' - Ego. Now understanding his folly, the sisters approached him and said 'O more bhai, ave to gaj ti utro' (O my dear brother, at least now get down from the elephant). This saying from the sisters led Bahubali to question "Am I really standing on any kind of elephant?". From this question he soon realised that the elephant he was standing upon was his pride and ego. As Bahubali realised his mistake, shedding his pride and ego, truth and enlightenment dawned upon him.Blessed with the knowledge of Truth, Bahubali went to see his father who welcomed him. Bahubali began teaching and showing people the right path. Bahubali is a major figure in Jain hagiography. His story exemplifies the inner strength of Indian culture. He won everything from his brother and could have become an emperor, but he returned everything to the brother. Bahubali is considered the ideal of the man who conquers selfishness, jealousy, pride and anger. The holy festival of Mahamastakabhisheka is held every 12 years in the town of Shravanabelagola in Karnataka state, India. During this festival the statue of the lord is worshiped and anointed with Holy water, Milk, Turmeric and other natural herbs which has its own significant importance. There are 5 monolithic statues of Gomateshwara or Bahubali present in Karnataka State, which measures more than 20 feet in height. One recently carved statue of Bahubali is located at Dharmasthala. A statue is being carved at gujarat. 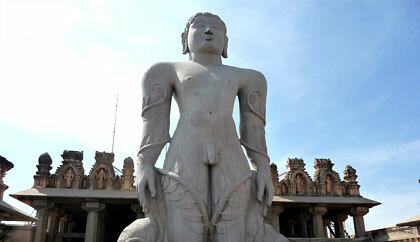 A statue of Lord Bahubali is located at Shravanabelagola in the Hassan district of Karnataka State. Shravanabelagola is a sacred place of pilgrimage to Jain with a splendid and lofty statue of stone on top of a hillock there. When standing at the statue's feet looking up, one sees the inspiring vision of the saint against the vastness of the sky. The figure is lofty like the sky, and the serenity of the face is unique and incomparable in its beauty. This statue of Gommateshwara Bahubali is carved from a single stone fifty-seven feet high. The giant image was carved in 981 A.D., by order of Chavundaraya, the minister of the Ganga King Rachamalla. As recently as 20 years ago, a huge statue of lord Gommateshwara was built at Gommatgiri, 14 kilometres north of Indore, on the Airport road. It is a good miniature copy of the original statue at Shravanabelagola. 5 of the most famous Jain temples in India are detailed here. The magnificently carved Dilwara Temples are believed to have been built around the 12th century. They have intricate and striking carvings in marble that are still very well preserved. Located in the Aravali Ranges in Rajasthan, each of the five temples were built in honour of a different Tirthankara, and include images of Jain saints, beautifully detailed pillars and even a hall with 360 miniature idols of Jain Tirthankaras. This temple complex is considered by many as one of the most beautiful Jain temples in the world. While this World Heritage Site has gained prominence for its provocative statues that adorn many of its temples, it also has a number of Jain temples that were built over a thousand years ago. The Jain temples are located in the eastern section of the town, and are a good example of medieval Indian Architecture. While Khajuraho is a small town, it has many different temple sites to see and all are very well maintained, so it is worthwhile taking a few days to explore them properly. One of the most sacred Jain temple complexes, Palitana, has over 3,000 brilliantly carved temples located in the Shatrunjaya Hills in the Gujarat District of Bhavnagar. Built over generations from the 11th century, this is a revered pilgrimage site. With over 3,800 stone steps, the climb is not easy, but that does not deter thousands of devotees from going there every year. Located in the town of Shravanabelagola in Karnataka, this Jain Temple has a massive black granite statue of Gomateshwara, the first Tirthankara, which stands 18 metres tall. The statue is made up of a single block of granite and is positioned on the top of the Doddabetta hill. Every 12 years, pilgrims flock to this mountain for Mahamastakabhisheka, an important Jain Festival, where the statue is bathed and anointed with milk, saffron paste and dusted with powders of turmeric, sandalwood and vermillion. The elaborate Ranakpur Temple was built in the 14th and 15th centuries in the Aravali Ranges. It arises from the hill in three levels, which are supported by no less than 1,444 carved marble pillars. All the detailed carvings in this beautiful temple are unique, including one single marble rock that has the heads of 108 snakes and a tangle of tails. Considered to be a brilliant example of devotion and workmanship, this temple is certainly worth making the visit to from nearby Udaipur.